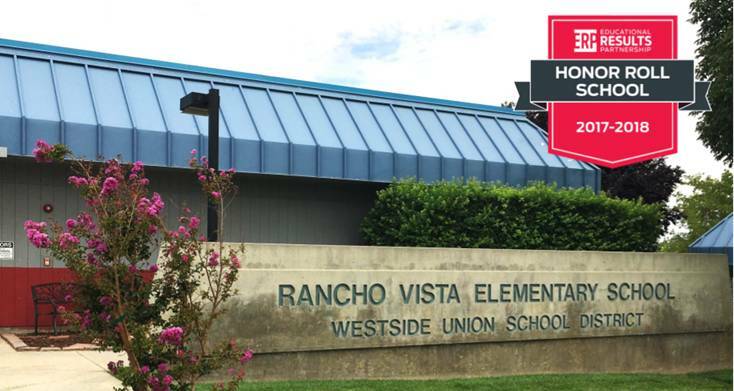 LANCASTER – Students and staff at Rancho Vista Elementary School received the 2017-2018 Educational Results Partnership (ERP) Honor Roll Award for demonstrating a track record of high achievement and student success. The program, sponsored by the Campaign for Business and Education Excellence, is part of a national effort to identify higher-performing schools and districts that are improving student outcomes. Westside Union School District was one of 24 public school districts in California to be recognized. Other schools within the District have also been recognized in the past as an Honor Roll School, such as Anaverde Hills, Esperanza Elementary School, Hillview Middle School and Gregg Anderson Academy. The 2017 – 2018 Honor Roll Award is developed by ERP, a nonprofit organization that applies data science to help improve student outcomes and career readiness. ERP maintains the nation’s largest database on student achievement and uses the data to identify higher-performing schools and districts. School districts that receive ERP Honor Roll distinction have demonstrated consistent high levels of student academic achievement, improvement in achievement levels over time, and a reduction in achievement gaps among student populations.